RAPAPORT... The Gemological Institute of America (GIA) has updated the language in its lab-grown-diamond certificates to conform to the recent Federal Trade Commission (FTC) guidelines. The grading lab will no longer use the term synthetic when referring to diamonds created in a lab, either inside its reports, or in the title, it said Friday. 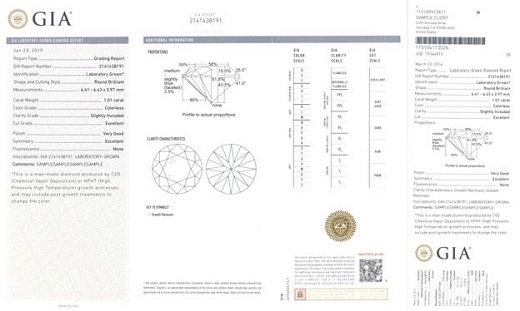 The GIA will continue to use descriptive terms of color and clarity for lab-grown diamonds, indicating the range of grading they refer to on a scale in the report. Earlier this month, HRD Antwerp announced changes to its lab-grown-diamond reports, including updating the language to match those of natural diamonds, and expanding its color categories for synthetic stones. It will also launch a lab-grown-diamond-jewelry report in September. The new GIA lab-grown-diamond reports will be available from July 1. Customers that have purchased synthetic-diamond reports from the GIA prior to that date can exchange them for a new certificate at no cost, the GIA noted. Correction, April 1, 2019: The GIA will not be adopting the same 4Cs descriptions that it uses for natural diamonds in its lab-grown diamond grading reports, as initially indicated in the above story. It will continue to use descriptions such as "near colorless" and "very slightly included" when describing the color and clarity of a lab-grown diamond.